Adept Heating & Mechanical Services Ltd - Central Heating Engineer based in Pulborough, West Sussex. 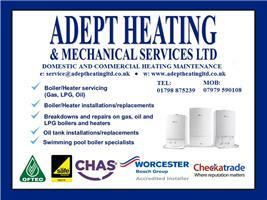 Adept Heating & Mechanical Services Ltd are a family run business that has been established for over 19 years. We are Gas Safe & Oftec Registered, Worcester Bosch Accredited Installers. We are a small family business based in Pulborough, West Sussex, carrying out commercial and domestic heating services. We offer annual services on all heaters and boilers (with the exception of electric heaters) including swimming pool heating and renewable energy products such as air source heating pumps. We also repair and replace LPG, natural gas and oil fired heating appliances. Adept Heating & Mechanical Services Ltd has been established for over 19 years, in which time we have grown a respectable client list across the Southern region. We are Gas Safe & Oftec registered, Worcester Bosch Gold accredited installers, CHAS and SPATA members. Our company is built on the principles of installing quality products and providing a reliable service. We are continually striving to improve our standards by listening to our customers. Our large customer base is testimony to that. Our experienced Gas Safe and Oftec registered engineers attend regular Worcester courses to keep up to date with all the new products and installation methods. They are knowledgeable with all natural gas, LPG and oil fired heaters, house boilers, swimming pool boilers, warm air units and water heaters. Our engineers can repair and service almost all makes and models of heating appliances, some of which include Worcester Bosch, Grant, Potterton, Vaillant, Baxi, Laars, Certikin, Glow Worm, Johnson & Starley, Powrmatic and Benson. Pulborough, Horsham, Billingshurst, Brighton,Lewes, Hindhead, West Sussex, Hampshire, Surrey, Kent.